Canva never misses a chance to delight us! After becoming the world’s most successful design tool, Canva decided to conquer another area where most design apps failed to provide an ultimate solution. The iOS app store is flooded with design apps but only a handful can boost to provide the usability that the modern user demands. Most popular design apps are focused on illustration. Even though they prove to be an excellent tool for drawing they can hardly satisfy the needs of the common user. This is exactly where Canva stands out the most. After downloading the app on your iPhone or iPad you can immediately log into your existing account or simply create a new one. You will be guided through the app’s main features, including new text templates, design layouts, clipart and lots more. It’s surprising how quickly the app syncs the existing design projects. It allows users to open old designs with heavy imagery and various graphic elements directly from their phone. Users are also able to work on their original projects without experiencing any drawbacks from using a mobile device instead of a PC. Most design apps would cut out a heavy amount of features when optimizing their product for mobile users. 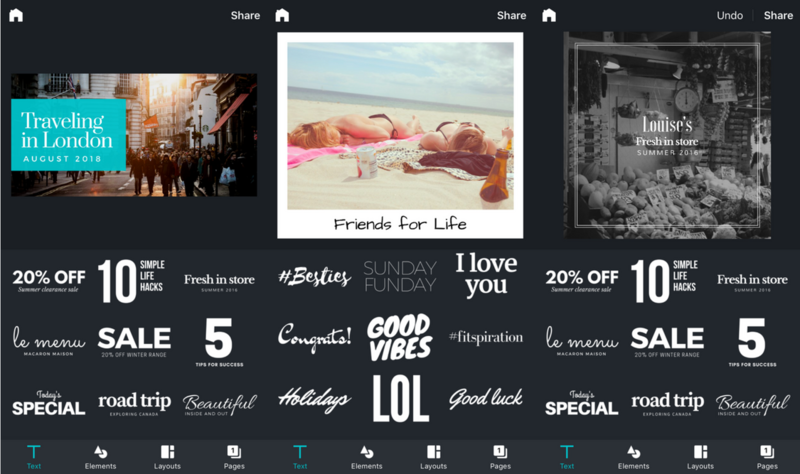 Yet, Canva actually expanded on their initial product. They created an additional set of features that would best serve its mobile users. Text templates: The text templates are completely redesigned for mobile users. They now feature shorter, more actionable quotes that are ideal for social media publications. Choose a text template from the collection. Tap it to apply it to your design. To resize, simply pinch in or out. Rotate it by turning your fingers in the desired direction. To delete it, tap the three dots on the upper left of the object and choose the trash bin icon from the upper menu. Design layouts: You can now design your very own social media post on the go with a completely new set of templates that look great on any screen size. Besides the popular Instagram, Twitter and Facebook graphic layouts, you’ll be able to choose from a variety of layouts that are also available on the Web app. 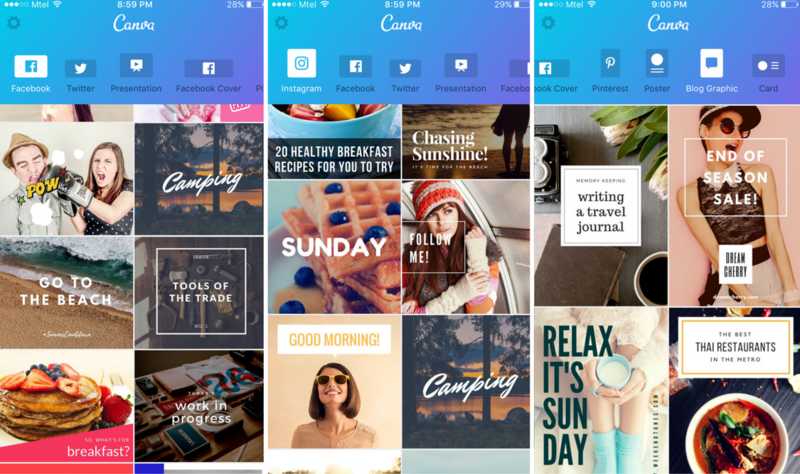 Canva for iOS currently offers twelve design templates and promises a lot more additions in the future. The initial list of design layouts contains the following: Instagram post, Facebook post, Twitter post, Pinterest post, presentation, Facebook cover, poster, blog graphic, business card, youtube art, flyer, invitation. Note: The size of each layout is optimized for a particular social media post or design project. Make sure you’re using the right design template when creating your design. Otherwise, it will be harder to resize it afterward. 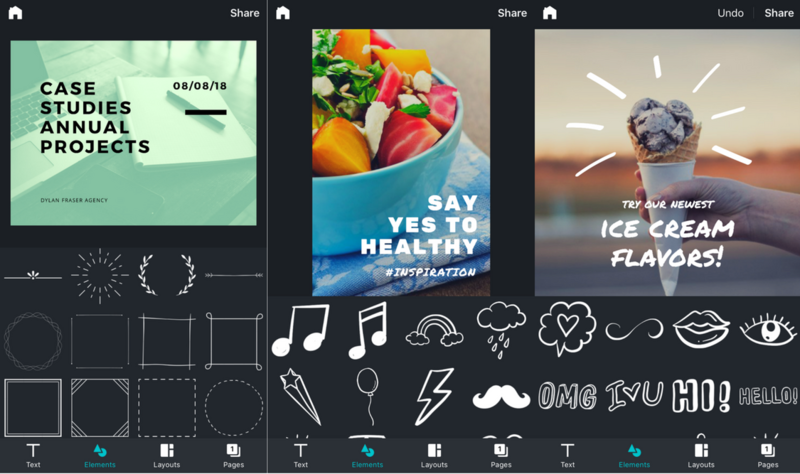 Graphic elements: The new app allows you to get creative on your phone with a totally new selection of clip art images. There are dozens of whimsical frames and carefully drawn stickers that you can choose from. The design elements on the iOS app are playful a have a contemporary artistic style. Choose the desired clip art from the elements section. Tap it to add it to your current design. Moving, resizing, rotating and adjustment options are identical for all element types. Snap & Swap: Besides using the photos from your library, you can now snap a picture directly with your device and swap it with any photo on your design. Share your creations: Click the “Share” button in the upper right corner of the screen. 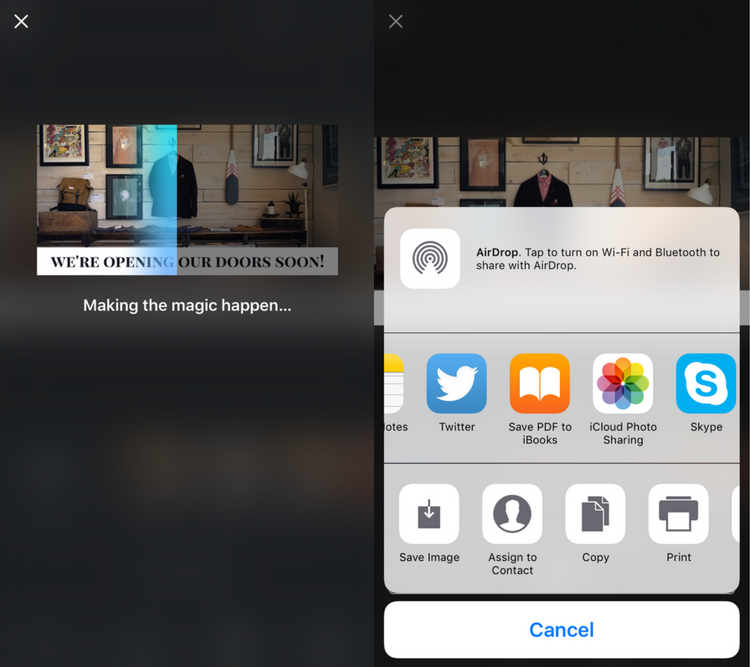 The app will prepare your design for upload and allow you to choose from a handful of options for downloading and direct social media sharing. You might be wondering why you should use Canva on your phone or tablet instead of your computer? Truth is, this pocket-sized Canva is just as good as the desktop version. If you’re frequent on Instagram or other social media channels you probably know that you can only upload content from your phone. The iOS app helps you skip the transferring process from one device to another. Being a mobile app, it also lets you create social media designs in their native environment. And there’s so much more it can do. When inspiration strikes, you’ll be able to not only wireframe your ideas but design them completely on the go. 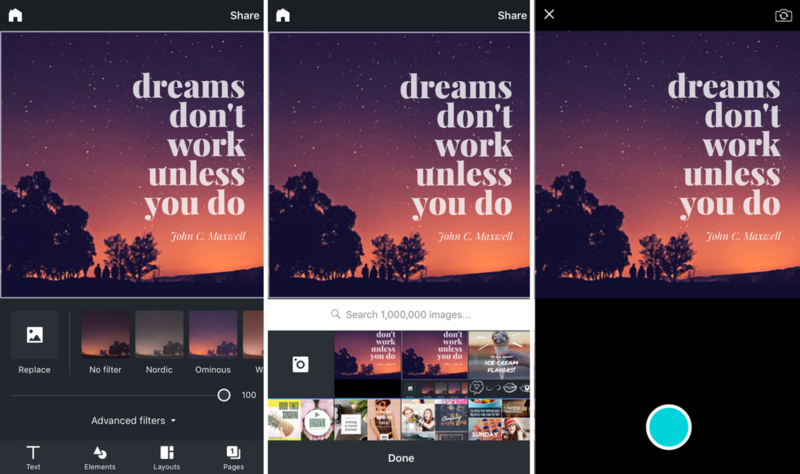 Now that you’ve seen Canva for iPhone in action, would you give it a try? Or you’re probably already a regular in the mobile design community? Let us know in the comments!